“Sometimes the clothes do not make the man…” sang George Michael. Fortunately the cover of C.J. 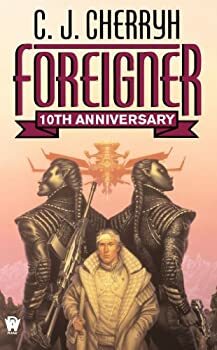 Cherryh’s literary sci-fi offering Foreigner can boast the same. The story contained within is (pun intended) light years from the throwback sci-fi cover. And the back cover is only slightly better than the front. The Publisher’s Weekly quote reads: “Cherryh’s gift for conjuring believable alien cultures is in full force here, and her characters… are brought to life with a sure, convincing hand.” Copy which is often overstated, and this statement is only partially true. The first part is a twisted untruth (or an insult to traditional Japanese culture), while the second part strikes the truth square on the head. In other words, ignore the publisher’s contribution to Cherryh’s 1994 Foreigner and look only at the content. Plot-thin but well-motivated, Foreigner’s focus is more on character and high-quality writing. Bren Cameron is the only human emissary living amongst an alien race, the atevi, after his spaceship is stranded on an unnamed planet. Bran’s life consists primarily of struggling within the unfamiliar modes and channels of the atevi social system to pacify hostile opinions regarding humanity. The position is challenging: he must come to terms with the two cultures’ differences while assaying diplomacy in a manner that respects both human as well as his alien host’s interests. An assassination attempt or social faux-pas always just around the corner, so the story is never dull. The setting of Foreigner is essentially James Clavell’s 1975 novel Shogun with sci-fi window dressing. Cultural interaction is the thematic nebula of Foreigner. While some readers may complain that the atevi seem too alien and plural, not an individual among them, the more discerning reader will appreciate Bran’s introspective monologues as he tries to work out their behavior, motives, and the implications surrounding the awkward relations. Like Bran must do, distinguishing between the atevi should be done with care by the reader. By portraying the love-less atevi as a more nuanced society, Cherryh thus gives the reader a realistic understanding of what meeting an Other may be like, whether they be alien or simply foreign to the reader’s culture. Deft but subtle characterization is the strength of Foreigner. For the less culturally aware reader, Bran will be easy to sympathize with. The uncertainties he faces daily in an unfamiliar environment are easy to imagine. The well-traveled (read: culturally sensitive) reader may find Bran whiny and obnoxious at the beginning — a Western tourist who complains when a Buddhist temple won’t allow entrance to people wearing shorts. Fear not, transitions do occur which satisfy all involved — and not in tones even approaching proselytizing or the politically correct. With regards to the cultural aspect, Cherryh seems to have done no more “conjuring” than to visit her local library for Benedict’s The Chrysanthemum and the Sword or Varley’s Japanese Culture, and then magnify a few aspects for her own work. Despite being ebony seven-footers, the humanoid atevi of the novel follow strict protocols of etiquette and social rigor, bow upon entrance and exit, believe in hierarchal duty, remain forever concerned about preserving their own and other’s reputations (i.e. “saving face”), practice Zen building and street alignment, condone samurai-esque blood feuds, and maintain strong links to their religious and traditional past while developing their world into a modern civilization. All of this evokes post-WWII Japan to me, so Cherryh’s aliens feature little originality from a sci-fi standpoint. That being said, it was never Cherryh’s intent to dazzle and wow with cultural inventiveness a la Jack Vance, but rather to hold a mirror up to Western society. Readers looking for fast, action-based science fiction may then avoid Foreigner (though perhaps their lives would be enriched for investing the time and thought). While the last 100 pages wrap up the book in breathtaking fashion, the first 300 are used to develop Bran’s relationship with the atevi, as well as dig into their cultural mindset. The book is thus written for those interested in the sociological and anthropological side of the genre. With characterization and human interest the themes of the day, fans of Ursula Le Guin’s HAINISH series will undoubtedly find something to like about the novel.